17th/18th c, pine, mineral pigments, gold leaf. 42″ w, 18″ d, 55.5″ h.
From the earliest times, some form of Buddhism has been the dominant religion of Tibet. Buddhists followers founded the monasteries. In the hope of attaining enlightenment and a path to a favorable rebirth, these Buddhists donated their time and effort helping build monasteries and furniture that filled them. 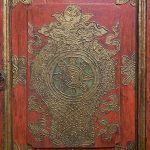 A large part of antique furniture found in Tibet today was originally used in monasteries. 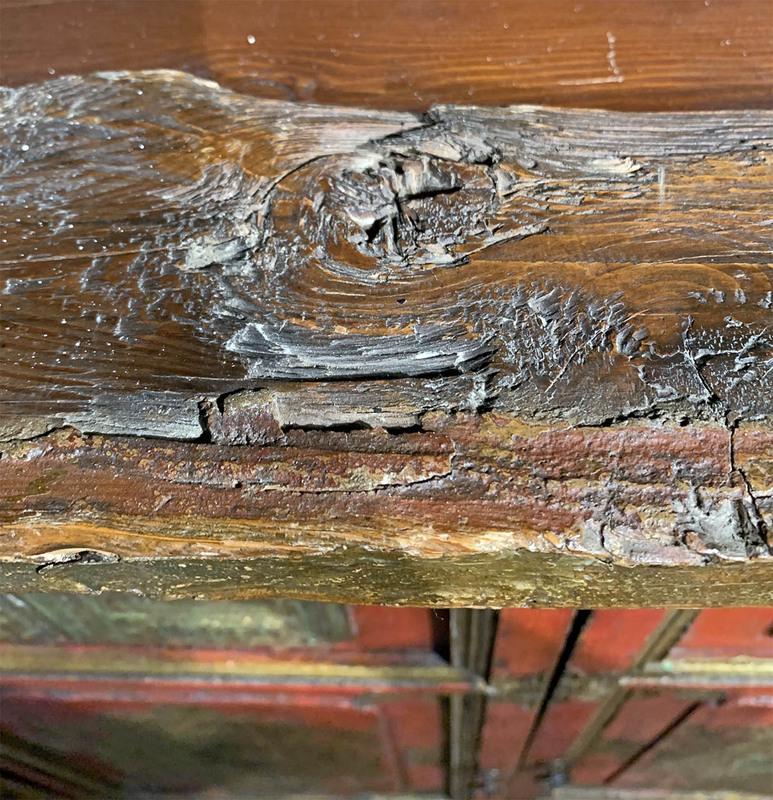 This cabinet is an excellent example of an ancient monastic piece. It exhibits rudimentary construction methods but a masterful decorating skill that the world came to value and love about Tibetan furniture. As Tibet sits on a high plateau, it has poor building material as only pine and other conifers could grow. Material and building technique consequently were not as important to the Tibetans as colorful decorations. 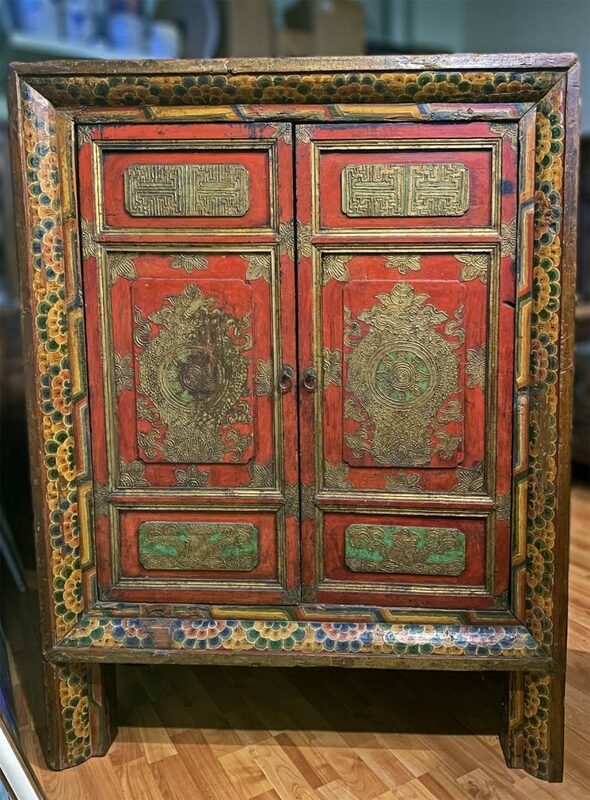 This cabinet was made by putting together slabs of wood and then elaborately painted religious symbols on them in a uniquely Tibetan gesso painting technique known as “kyungbur”. This technique calls for outlining the pictures with a thick application of gesso and then highlighting this raised gesso with gold leaf or gold paint. The work involves master artists and cabinet makers. So, cabinets coming out of monasteries are some of the finest Tibetan furniture. This cabinet employs the frame-and-panel method, with a pair of doors set into a sturdy frame. 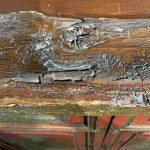 Crude method of construction can be seen in chisel marks on the surface of the wood frame. On the front, deep red cinnamon color was used as color base and decorations painted in mineral colors of green, deep blue, orange and yellow, colors used before late 19th century. The value of this cabinet is in the decorations on the pair of big doors. They are painted with Buddhism and auspicious symbols, all done in the “kyungbur” technique. Each door is divided into three decorative segments with each segment framed with bamboo-shaped molding overlaid with gold leaf. Each top and bottom shows a “taohuan panel”. The top panel is decorated with the key-fret motif, a symbol of wealth but here meaning spiritual wealth. The bottom panel has the Vase of Plenty, symbol of good fortune and abundance. 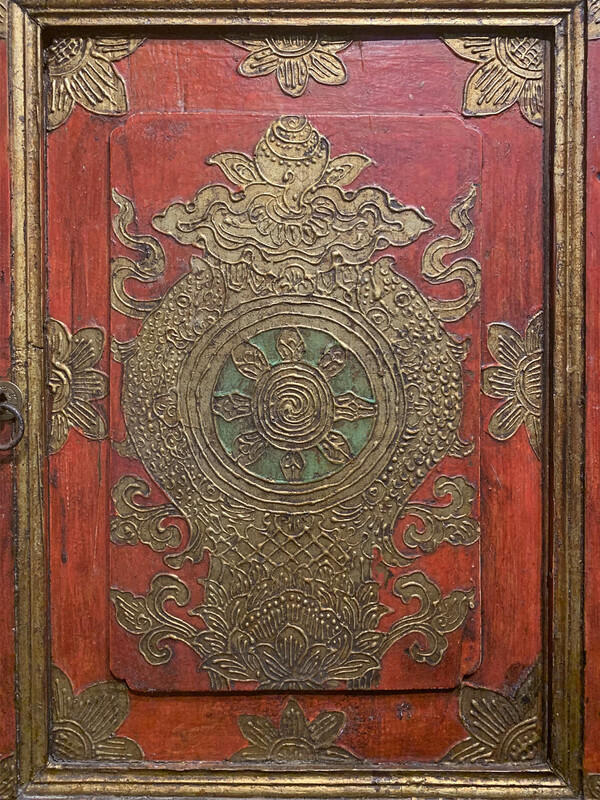 Prominently painted in the “kyungbur” technique in the central segment are three Buddhism symbols: Wheel of the Law or Dharma (Buddha’s teaching), the Double Fish (symbol of good fortune and abundance), and a group of Jewels representing the Buddhist community. Painted on the frame members are lotus flower petals, symbol of purity and enlightenment. This cabinet dodged a cultural revolution when so many cultural and religious furniture and arts were vandalized, damaged or destroyed. It survived in excellent condition and is a relic to treasure.